If we're honest, The Daily Mail would not be the first place we'd expect to find a consistent raft of interesting raptor-related stories, but - all credit to them - this consistently proves to be the case. 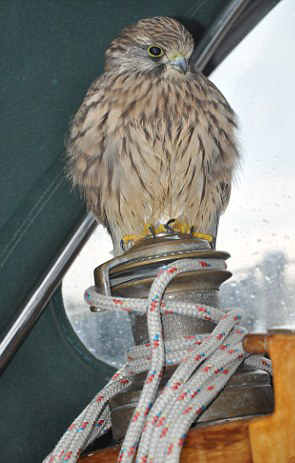 Late last year we read in their on-line edition of a Kestrel which had hitched back to shore aboard a 30ft Cornish pilot cutter being sailed from Holland to the East of England by Carol & Max Raffe from Crowfield in Suffolk, just a few miles down the road from where we are based in Stonham Aspal. Some 25 miles out to sea, Carol felt a tapping on her neck and was surprised to turn and find the exhausted kestrel sitting on her shoulder. After an abortive attempt to then make it back to the coast under it's own steam, the bird - which Carol & Max nicknamed 'Lucky' - landed back on deck. She remained there for the remainder of the voyage until landfall was reached at the mouth of the River Deben, when she took off to perch on the nearby church in Ramsholt. Carol said of when the bird joined them: "There was nothing in sight except a nearby wind farm so I was completely stunned when it bird landed my shoulder. We just could not work out how a land bird was so far out at sea. "My shock must have made it decide to move off and it then settled near the coiled mainsheet. We tried to give her food as she looked absolutely famished but it seemed to spook her and she took flight - weirdly landing on the water. As she is a land bird we became terrified that she might drown as she would have no natural swimming skills." 'But she managed to regain herself before landing on my husband’s shoulder and then settled down on the boat and stayed with us for four-and-a-half hours. She was like a seasoned sailor and soon just pottered about the boat and didn't seem to care about us at all. … but as the voyage wore on, she became quite accustomed to her situation.